Bloomsbury is an area of central London in the south of the London Borough of Camden. 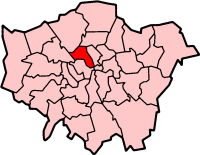 Wikimedia Commons has media related to Bloomsbury, London district. This page was last changed on 13 May 2017, at 03:40.